Within the context of the series Masterpieces from the World's Museums in the Hermitage a new exhibition has opened in Hall 231 to display Raphael's painting of The Madonna with Christ and St John the Baptist (The Madonna Alba) which is on loan from the National Gallery of Art (Washington, D.C.). Though painted in Rome, apparently on a private commission, the painting was hanging in a church near Naples in 1528. In 1686 it was acquired by Gasparo de Haro y Guzman, the Marquis del Caprio, who was the Viceroy of Naples from 1682 to 1687. It was inherited by his daughter, who married the Duke of Alba. It was kept in the family's palace in Madrid for more than 100 years, until 1802. This explains the painting's second name, the Madonna Alba. In 1820 the painting ended up in the collection of a banker, William G. Coesvelt, from whom it was acquired in 1836 at the behest of Nicholas I, who wanted it for the Hermitage. For nearly a century the canvas adorned the Museum's permanent display of Italian art. After the Revolution, in 1928 the Museum received a secret document listing art works to be sold off. There were 28 items. Number One was The Adoration of the Magi by Botticelli. Number Two on the list was the Madonna Alba by Raphael. In 1931 the Madonna Alba together with a number of other works of art was acquired by the American billionaire and US Treasury Secretary Andrew Mellon. 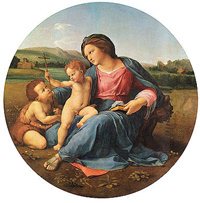 In 1937 Mellon donated around 20 paintings from the former collection of the Hermitage to the National Gallery of Art inWashington, including two masterpieces by Raphael - Saint George and the Madonna Alba. Culture news archive for 09 September' 2004. Culture news archive for September' 2004.